Every decision is a trade off. Since we can’t have it all, choosing one thing is not choosing another. What trade off do I want to make? How can I do this deliberately rather than by default? You need time and space to adequately consider the tradeoffs before you. Southwest airlines deliberately rejecting certain options so they could focus on their core business. Businesses that choose a straddling strategy. Trying to imitate a competitor while keeping their old strategy doesn’t work. Johnson and Johnson’s response to the Tylenol cyanide crisis. Businesses with lengthy mission statements or lists of values. The chapter opens by talking about the financial success of Southwest Airlines which is an example of a business with an essentialist strategy. Southwest said “no” to many things so they could focus on their strategy. What does this suggest about the promise of essentialism? A person that is chronically late and stressed is often trying to fit in “just one more” email or action item. This has a domino effect on other important things. What insignificant things are you attempting in the name of “efficiency” that are undermining your focus? Are there tasks/responsibilities that are a part of your routine just because they seem easy for you to accomplish? Are there things that you are doing that are not a priority, but that you don’t quit because they are not difficult? 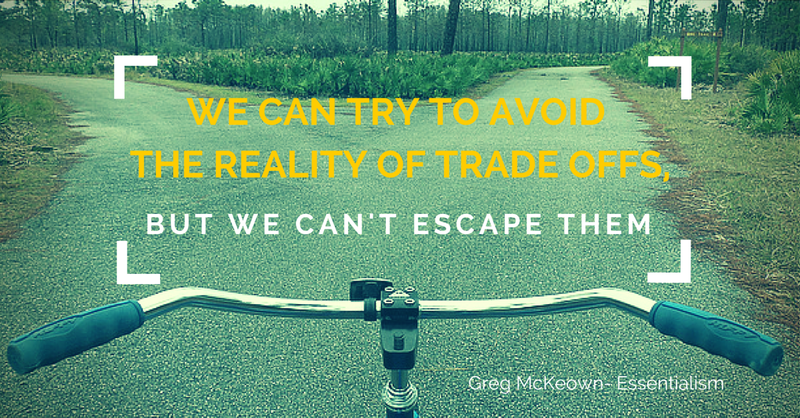 We often multitask when we fail to recognize the reality of trade offs. What happens when you multitask? What trade offs are you making? What are you giving up? What are you gaining? There is a difference between making trade offs deliberately vs. by default. Think of a significant disappointment in your life/business. Was there a tradeoff in your choices? Was it one that you made intentionally or that you allowed others to make? McKeown suggests that lengthy mission statements and lists of values show the failure to grapple with the reality of trade offs. Have you seen this? Do you agree or disagree? The nonessentialist says “I can do it all,” the essentialist says, “which problem do I want?” What problems are you facing because of your attempts to do too much? Think of a choice that is in front of you right now. Consider the options and ask “which problem do I want?” This will require you to think of the potential outcomes of saying yes to various possibilities. Reflect on this. McKeown says, “instead of asking ‘what do I have to give up?’ ask ‘what do I want to go big on?’” Think of an upcoming personal decision and use these two questions to analyze it. Make a list. How does each approach affect your feelings about the decision? We often feel guilt because of FOMO, “fear of missing out.” How can being deliberate about your choices help with these feelings of fear or guilt? In order to make tradeoffs wisely we have to take lots of time for exploration and reflection before we commit. Consider a recent life decision. Did you have time to truly explore the various options before choosing? Why? Why not? Mckeown says, “To discern what is truly essential we need space to think, time to look and listen, permission to play, wisdom to sleep, and the discipline to apply highly selective criteria to the choices we make.” What grabs you the most about this statement?